Ideal for users of DSLR, compact system and bridge cameras, this book is packed with practical techniques that will instantly transform your pictures. Many iconic images included by acclaimed photographers will inspire you to grab your camera and put it all into practice. Photographers include Henri Cartier-Bresson, Martin Parr, and Sebastião Salgado. Lea este libro si desea tomar buenas fotografías walks you through the fundamentals of composition, exposure, light, lenses and the all-important art of seeing. Henry Carroll studied photography at the Royal College of Art and his work has been featured in a number of international exhibitions and publications. Building on his experience teaching aspiring photographers of all ages, Henry founded frui.co.uk, one of the UK's leading providers of photography courses. Henry's clear, jargon-free style of teaching has demystified digital photography and inspired thousands to get creative with their cameras. 6. 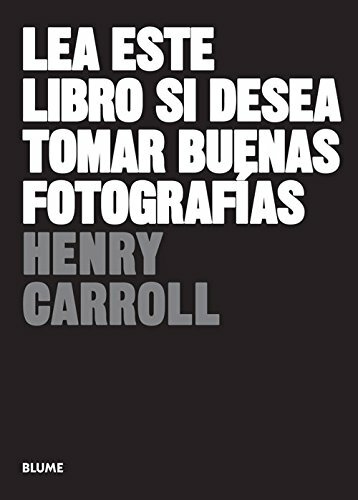 LEA ESTE LIBRO SI DESEA TOMAR BUENAS FOTOGRAFÍAS.